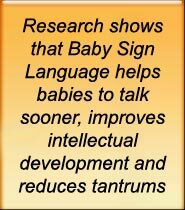 Baby Sign Language | Why Use Tinytalk Baby Signing? 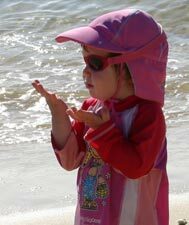 Why Use Baby Sign Language? Babies are intelligent little people and from the moment they are born, they start to learn so much about the world around them. Before they learn to speak, their only effective way of expressing themselves is through pointing, crying and screaming. This can be extremely frustrating for babies as they have the same natural instincts as us to communicate and be understood. Try not talking for a day or expressing yourself to those around you and you'll understand why babies cry! Babies experience the frustration of not being able to communicate clearly every day until they can talk properly at about 2½ years old. Even though babies lack the skills to talk, once they are around six months old, they have the ability to communicate using signs. There are so many benefits to baby signing, but the greatest benefit of all is the amount of fun and enjoyment it will bring into the life of you and your baby. The sheer excitement you’ll experience when your baby makes their first sign is as memorable as watching them take their first step. I was hooked and you will be too! Your baby will be so excited that you understand them. You and your baby will love signing, and simple activities and outings will become an opportunity to learn and communicate in a way you never thought possible. Tinytalk makes for happier babies - and happier babies make for happier parents and caregivers! Copyright © 2005-2010, Tinytalk. All rights reserved.